Call to arrange a private tour. Day 1 — Noon pick up in Orlando, 2 hour drive to our beach house. 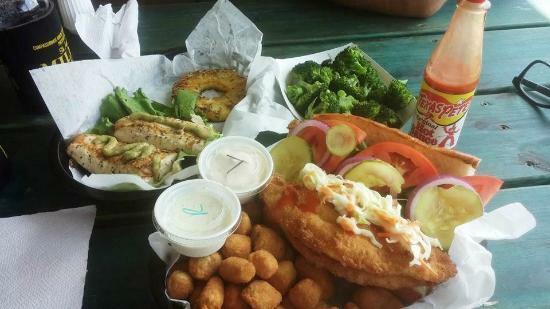 Settle in, happy hour, walk on the beach, then fresh fish on the grill. The group can meet our native guide Stacey, who's family has lived in the area since 1611. If you have any questions regarding local history or natural history Stacey will have your answer. Day 2 — We will paddle GTM Research Reserve! 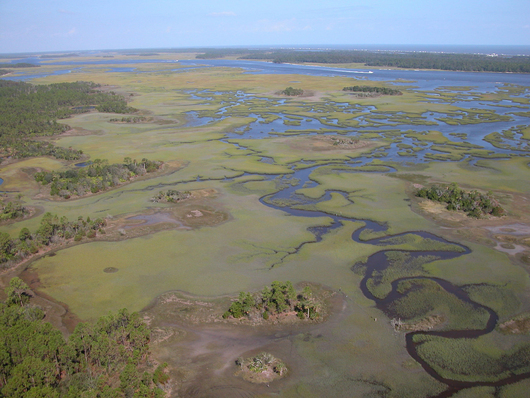 The coastal estuary offers incredible views of lush vegetation, nesting bald eagles, and possible encounters with the Atlantic bottlenose dolphin and the West Indian manatee. Most of all, this area provides a glimpse into what real Florida has to offer; sheer beauty nestled between civilization to the north and south. We can then have a lunch at the picnic area before we hike through the hammock, scrub and flatwoods in the interior portion of GTM Research Reserve. You can check out the map of trails at this link. We can also visit the education center on location. 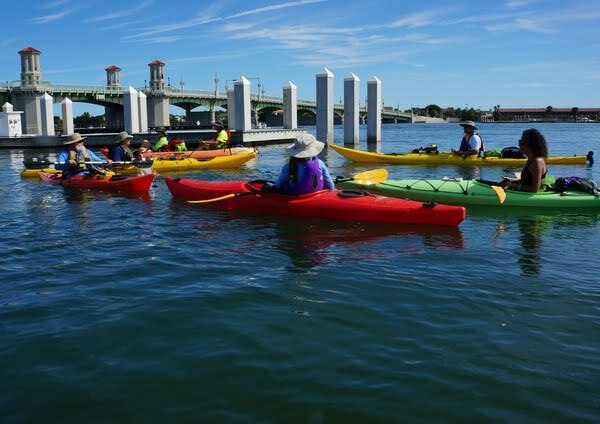 Day 3 — Paddle Pellicer Creek and Explore Princess Place Perserve. We will begin our paddle at Faver Dykes State Park. 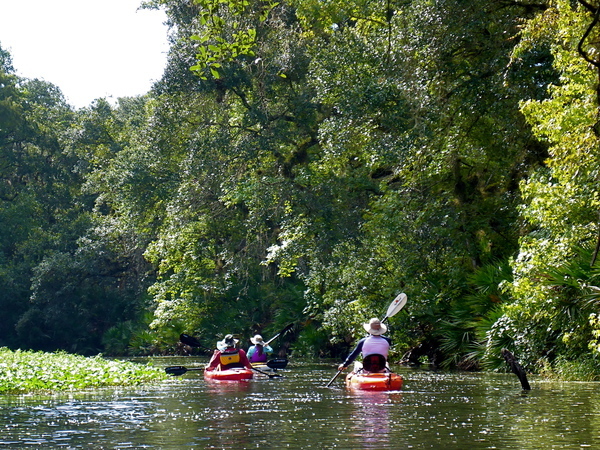 This tranquil park borders Pellicer Creek which flows about 6 miles from I-95 to Matanzas River. 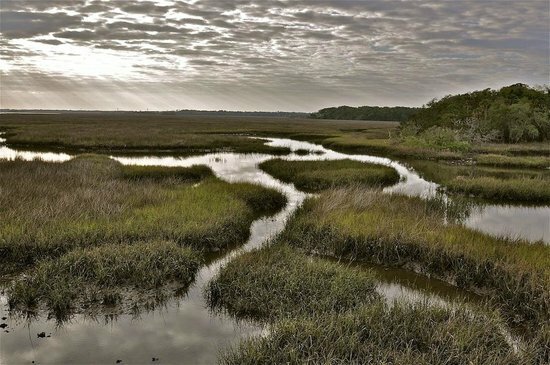 Day 4 — Tucked away in western Flagler County lies Haw Creek Preserve, a 1000 acre tract of land bordering Haw Creek for about two miles on its southern boundary. The area was set aside to preserve the cypress oak and hardwood swamp that borders Haw Creek. Many Haw Trees line the creek and produce the small-apple like fruit from where the creek gets its name. The fruit is popular for making jelly. The preserve has restrooms and picnic area with shelter. There are also interpretive nature trails with winding boardwalks. 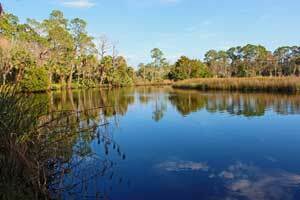 Haw Creek is a blackwater creek with abundant gar fish making their familiar rolls along with trout, bass and blue gill. Most of the banks are high and lined with the usual shrubs and trees, including the Haw Tree in which the creek gets its name. The Haw Tree produces a small fruit in spring that some locals make jelly with. Wild hogs, turkey, deer, osprey, owls and bald eagle are in this area. There is no development as most of the creek is protected by the preserve and state forest, and water management. We will launch from Russell Landing and head west(downstream) and paddle approx; 4 miles on main branch of Haw Creek to beautiful Dead Lake and back to launch. At first glance from launch it appears Haw Creek is solid land, due to some duckweed coverage, fortunately the duckweed is very light, just on the creeks surface, easy to paddle through and it's only for the first half mile or so. I have spotted a very large reddish-brown wild hog on the bank just .75 miles from launch site. Haw Creek is very scenic and serene with little visible footprint from man. Lots of shade is provided under canopy of live oaks and palm trees. Staying on the main branch of Haw Creek, the banks are high and dry on by sides near the preserve. This is a very pretty scenic journey, as we come closer to Dead and Crescent Lake; you will notice the banks receding as we enter the floodplain of Dead and Crescent Lakes. Approx; 7 mile paddle trip. 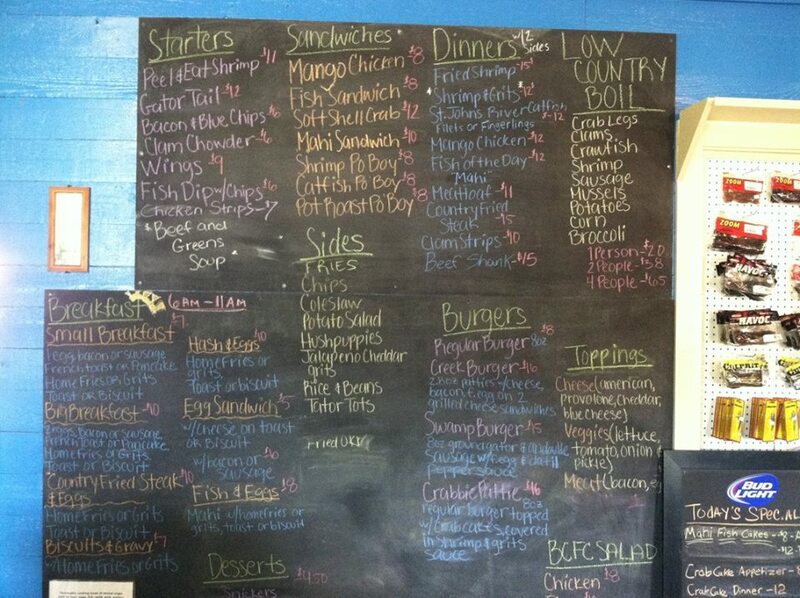 Dinner will be at the Bull Creek Fish camp. Expect the amazing! Day 5 — (Deep Creek Conservation Area) We will paddle this pristine hardwood floodplain that meanders through 4500 acres of real Florida swamp. This is the perfect winter location to enjoy protection from the strong coastal breezes while we explore this incredibly diverse landscape of cypress, sweet gum, and tupelo trees with an abundance of wild flowers. This is a local favorite for birders due to the large numbers of large wading and marsh species. Day 6 — Hospital Creek is a short 3 mile paddle. However, with so much to look at, it can be stretched into a full day of relaxing fun. Manatee, dolphin and many bird species can be spotted in Hospital Creek. This creek is easily accessible from the mainland side of the Vilano Bridge. To the North of the launch is the Florida School for the Deaf and the Blind which was established in 1885 and is now the largest school of its type in the United States with 47 buildings and 82 beautiful acres. South of the launch, heading toward historic downtown is Ponce de Leon’s Fountain of Youth Archeological Park which has periodic reenactment cannon fires. Further south of the Fountain of Youth is the old Mission with its great Cross which rises 280 feet above the marshes. 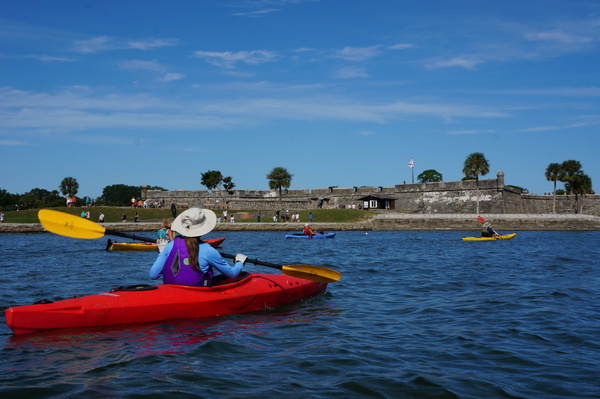 The creek opens up into the Matanzas River with a spectacular view of the Castillo de San Marcos along with the rest of the historic area from the bay view. To further the distance of this trip one can kayak under the famous Bridge of Lions into the Marina which is the El Galeon’s American port. Upon reentry into the creek Bird Island is to the east which is just the right size for a private lunch and a place to stretch your legs.